What a freaking cute couple! Seriously! Can we just skip all the way to next summer for their wedding??? Because I know it is going to be amazing! 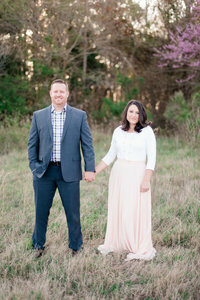 This Norfolk Botanical Gardens Engagement Session is definitely a favorite! We met up with CJ and Christie at the Norfolk Botanical Gardens. This place is one of my favorites and it was nice to just walk around and enjoy the gorgeous scenery with these two. I am not sure how we get blessed with such awesome fun couples. CJ came ready for anything and Christie was just full of smiles throughout the whole session! As the sun began to go down we spent a little time in the rose garden. Even though it was a little challenging to shoot with the light at that moment I just loved how the images turned out! Some of my favorites from the day! The sun and the roses and them two laughing and holding one another was absolutely perfect! We ended the session on East Beach. Of course we all know this is one of my favorites spots! CJ’s parents met up with us with their dog Teddy. Teddy is a beautiful golden retriever with a reddish golden coat. We also know that I have thing for dogs and when our couples bring their fur babies it just makes for an even more awesome session! I have never met a dog that actually posed and looked at the camera every time we took a shot! He is such a natural! I do hope we get to see him again for the wedding! What a cute ring bearer he would make! Thank-you Christie & CJ for such a fun day! You two are such a great couple and we cannot wait to celebrate with you both and your families next summer! To See more from the Botanical Gardens You Can See Hannah & Jeff’s Wedding! Also you can visit Bond & Kristina’s Wedding! Update! CJ & Christie’s gorgeous wedding the Botanical Gardens is a must see!! !